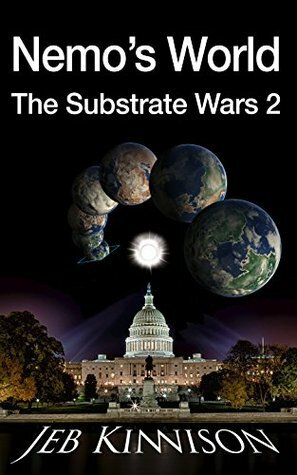 There is an interesting line in Jeb Kinnison's new novel, Nemo’s World: The Substrate Wars 2:“The reward for succeeding is more work.” Kinnison wrote a terrific sci-fi dystopian novel, The Red Queen. His reward for this success was writing the next novel in the series, Nemo’s World. Kinninson’s hard work paid off in the form of a wonderful and engaging sequel that anyone who is a fan of speculative fiction, particularly science fiction/dystopian fiction, will enjoy. ***Spoilers Ahead*** The novel picks up immediately after the events of The Red Queen. The students, along with a few older advisors, have escaped Earth, but the major governments on the planet are working to duplicate the technology and create more quantum gateways. They need to hunt down the rebels to stop the spread of the new technology. The governments are afraid that readily available gateways will open up a million habitable planets for colonization. Once people leave the Earth, the established governments will lose control (and power).As the US government draws ever closer to making its own gateway, it fights the rebels with a propaganda campaign designed to make them appear to be terrorists. But the rebels are not without resources of their own, and soon the President and the security agents find themselves under surveillance by the very technology they created.I read this novel in one sitting—something I do not always do—but every time I thought about putting it down, I wanted to find out what happened next. It is the type of book where you start thinking “I’ll just read a few pages more,” and then realize that another hour has passed and you are almost at the end, so you can’t quit now. I really wanted to find out about the wedding between two of the main characters, the baby in the works (so to speak), and the results of the court case as well as the outcome of the rebellion, the near civil war, and if the new colonies will succeed or if the attacks from Earth will destroy them.I think that everyone who enjoyed The Red Queen will agree that Nemo’s World is just as interesting as the first novel. Like the first novel, I really enjoyed the A.I. (artificial intelligence) chapters and laughed out loud where they start using humor. There is something wonderful about one A.I. “dissing” another one with the expression “your momma.” This is a five-star enjoyable read! Actual Rating: 3.5/5The Story: After fleeing to New Earth and setting up a rudimentary society comprised of the rebels and some of the world’s smartest minds in quantum physics and computing, Justin and his friends began to build a new system of rule that will benefit humanity. Their main focus is on opening up new planets as colony planets for anyone who wants to explore and settle new worlds. However, Dylan, with the full backing of the US government, continues to stand as a major obstacle, with the goal of wiping out his former friends in order to gain power.The Opening Line: Amanda Sundaram-Smythe’s body clock was still off, so she woke early enough to see two small crescent moons rising in the eastern sky before dawn.What I Loved: The implications and unlimited possibilities of the gateway technology and replicators are very cool. Instant access to new planets, the ability to end hunger and poverty, the freedom of people to create art and engage in higher thought, the idea of open communities that people can travel between with few restrictions. If this were ever to happen in my lifetime, I hope I would be brave enough to be a part of it. I also loved Dylan as a villain. He’s very smart, very focused, and has an uncanny ability to get what he wants. The political commentary and maneuvering was also very good, and I loved that it was a bigger part of this second novel.What I Didn’t Love: Occasionally, conversations between characters read like an agenda, checking off one item after another and transitioning very quickly, sometimes in the middle of a thought. So at times I wish the conversations felt a little more organic. This wasn’t a huge deal though, and I’ve had those kinds of conversations myself. And continuing from the first book, I’m beginning to be able to follow along with all the tech speak, but at times, I still just didn’t understand. Which is why I’m not a scientist, obviously.Final Thoughts: Thank you to the author for sending this along for review! It’s very much so science fiction, which I don’t read a ton of normally, but I’m definitely enjoying this series. It’s fun, the technology is awesome, and I would definitely want to go explore new planets. Here’s hoping I really don’t get caught up in anything this big in my lifetime, though – I would for sure crack under all the pressure. After having escaped the immediate dangers of the last novel, the intrepid explorers and students turn their minds to how to use their new discovery -- instantaneous travel to anywhere in the universe -- to benefit the rest of mankind. But in order to make this possible, they need to defang the governments and ruling classes of the nations of Earth. So most of this story is about how they manage to maneuver politicians into realizing that their time is over. It was actually quite enjoyable having the recalcitrant US government being one of the last holdouts, absolutely SURE that they could somehow avoid the consequences and do things that would bring back the status quo ante.I loved the idea of setting up colony planets and the gates to allow people to head there. (I have a soft spot for colonization and pioneering in my sci-fi in general.) It was such a hopeful vision -- a way to move past the stagnant and ossified way of doing things and into something new with all sorts of potential. (As well as some musing over how to avoid the mistakes of the past, which we see as the first group of explorers have to set up a government for themselves. )Great fun and a good addition to the series. I'm definitely looking forward to reading the next one when it comes out! Jeb Kinnison - I grew up in the Midwest. I studied computer and cognitive science at MIT, and wrote programs modeling the behavior of simulated stock traders and the population dynamics of economic agents. Later I did supercomputer work at a think tank that developed parts of the early Internet (where the engineer who decided on ‘@‘ as the separator for email addresses worked down the hall.) Since then I have had several careers—real estate, financial advising, and counselling.I have dealt with every one of the types I write about in my book, and one avoidant in particular started me down the road of studying attachment issues. Five years later, I am convinced wider knowledge of these types would save everyone a lot of heartache and suffering in bad and broken relationships.My book is available through and other distributors.